The original Skyline opened in 2010 and was pretty forgettable; not terrible, just nothing to write home about. But it was a solid gainer, earning $79M on a budget maxed out at $20M, and I'm surprised it took so long for a sequel. Especially one that, by all appearances, looks superior in just about every way. That's going to be the case when the cast is led by top brass action stars like Frank Grillo and The Raid's Iko Uwais and Yayan Ruhian. In what I have to admit is a pretty cool move, Beyond Skyline takes place concurrently with the last film, just in a different part of the world. Grillo plays a father in New York who must try to free his son while the world is invaded by aliens. The action looks intense, the soundtrack kicks, and I think if this were named anything other than Beyond Skyline it would have a lot more attention. It may be time to put our preconceived notions behind and start getting excited. 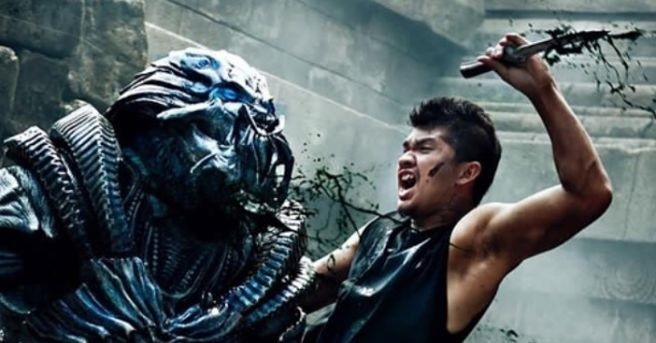 Directed by Liam O'Donnell, co-writer on the first movie, Beyond Skyline opens December 15th.